West End-Collegiate HD Extension map. 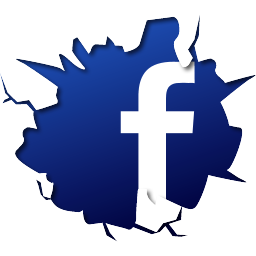 Image Credit: LPC. Commissioners voted unanimously to approve district two years after initial hearing, though split on the inclusion of modern apartment complex. 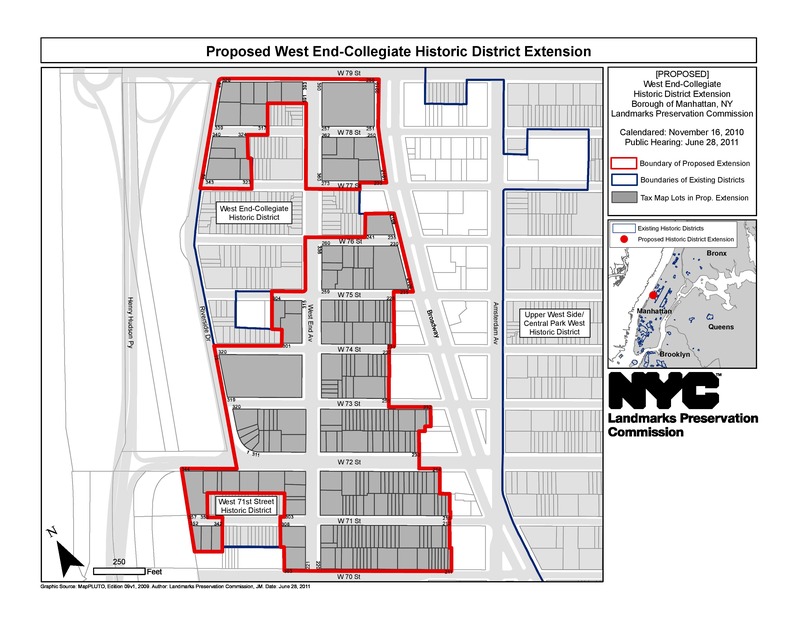 On June 25, 2013, the Landmarks Preservation Commission voted to approve an extension to the West End-Collegiate Historic District, encompassing 200 buildings. The extension more than doubles the size of the previously designated district, and lies to the north and to the south of the original district, between 70th and 79th Streets, and Riverside Drive and Broadway. The district is primarily residential, characterized by rowhouses and apartment buildings built in the period between the 1880s and the 1930s. The first wave of development in the area saw the construction of single-family rowhouses, constructed in brownstone, limestone, and brick in a variety of architectural styles, including Beaux-Arts, Queen Anne, Renaissance Revival, and Romanesque Revival. In the 1890s, as apartment living lost its stigma among the upper class, the neighborhood saw the construction of several “French flats” or small, multi-family dwellings. Through the turn of the century to the turn of the 1930s, elevator apartment buildings dominated new construction. At the June 28, 2011 hearing, designation was supported by Borough President Scott M. Stringer, State Senators Thomas Duane, Bill Perkins, and Adriano Espaillat, Council Member Gale Brewer, and Manhattan Community Board 7. Preservationist groups that testified in support included the Historic Districts Council, the New York Landmarks Conservancy, Landmark West!, and the West End Preservation Society. Numerous residents also spoke in favor of designation. Opposition came from the Real Estate Board of New York’s Michael Slattery, who argued that the proposal represented an “unwarranted broad brush approach” to designation. Some individual property owners opposed the inclusion of their buildings in the district. The owners of a 1941 apartment building at 300 West 72nd Street asked that their building be classified as “no style” in Landmarks’ designation report, while the Research Department recommended it be identified as “Moderne.” Commissioner Michael Goldblum said of the building that it was “clearly of a style” but wondered if a note could be made in the designation report to make it easier for applicants to modify the building. Commissioners Perlmutter and Bland found a no-style designation appropriate. The commission ultimately voted to designate the district as it was heard, without modifications. In voting for designation, Commissioner Roberta Washington called the district “a cohesive architectural community,” and Commissioner Bland called it “an extraordinary group of buildings.” Commissioner Goldblum found the district to merit designation for its “defined character” that was “unique to New York.” The vote for designation was unanimous. On October 22, 2013, the City Council’s Land Use Subcommittee on Landmarks, Public Siting, and Maritime Uses voted to approve the extension to the West End-Collegiate Historic District. Local Council Member Gale Brewer recommended the Committee approve the extension as approved by Landmarks with minor modifications. Council Member Brewer recommended that 234 West 73rd Street and 214 West 72nd Street be removed from the district. Chair Brad Land led a unanimous 5-0 vote to approve the extension with the modifications proposed by Brewer. The Land Use Committee is expected to approve the extension at its October 24th meeting. LPC: West End-Collegiate Historic District Extension, Manhattan (LP-2462) (June 25, 2013). I applaud Ross Sandler’s commentary on San Gemignano. There can be thoughtful moderation between the sky’s the limit and neighborhood preservation. Butzel’s response hit the nail on the headby noting that money is the only thing that talks in this city. Re Mark Willis’ comment—How high is high enough? Who are these people who want to live and work and CAN AFFORD these super high rises? What do these buildings displace?